"Enforcing Criminal Law Through Civil Processes: How does Human Rights Law Treat 'Civil for Criminal Processes'?" 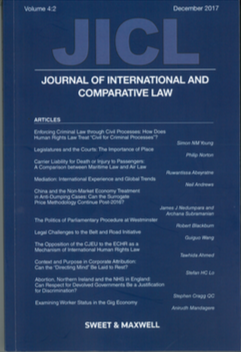 Abstract: The distinction between civil and criminal procedures has blurred with the advent and growth of hybrid procedures. Governments in common law jurisdictions have created civil processes and penalties to further criminal law aims. This article describes them as “civil for criminal processes”. Some controversial examples include civil forfeiture, anti-social behaviour orders and measures targeting money laundering and insider dealing. They serve as an alternative to traditional criminal proceedings. Foregoing the sanction of imprisonment and stigmatising effect of a criminal conviction, these civil processes provide governments with evidential and procedural advantages and greater opportunities for case settlement. But human rights law has treated civil for criminal processes inconsistently, deeming some as criminal proceedings and therefore entitled to high levels of procedural protection and others not. This article explores different approaches developed by the European Court of Human Rights and the Supreme Court of Canada. It argues in favour of the Canadian approach, defining the “criminal” sphere more narrowly, and calls for the concomitant, principled development of adequate procedural protections in civil for criminal processes. Click here to download the full article.